Tesa Spell attended nursing school at Lamar State College in Orange, Texas. She started as a licensed vocational nurse, followed by an Associate’s degree in nursing becoming a Registered Nurse. She further pursued nursing by attending the University of Arlington nursing program earning a Bachelor’s degree in Nursing. She completed graduate school in Lake Charles Louisiana earning a Master’s degree in Nursing from McNeese State University. She became a board certified Family Nurse Practitioner through the American Association of Nurse Practitioners. With over 10 years of hospital experience, Tesa has always enjoyed working in cardiology. She started as a LVN working in a step down intensive care unit in Beaumont, Texas. After becoming a Registered Nurse, she transferred to the intensive care unit to care for critically ill patients. After extensive training, she managed continuous renal replacement therapy patients, hypothermia (after cardiac arrest) induced patients, then transferred to the cardiovascular ICU to care for post-operative cardiovascular patients after open heart surgery and peripheral vascular surgery. When her family moved to Waco, in 2013, Tesa transferred to Providence Hospital to work in the intensive care unit where she continued to care for cardiac patients in the ICU until completing her education. She is BLS, ACLS and Stroke certified. Tesa is happily married with four children and active with her children in school, sports and exercise. She attends CrossFit regularly and enjoys attending her children’s sporting events. 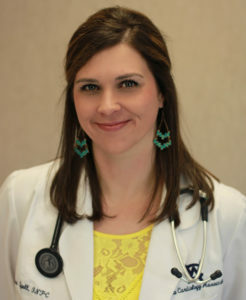 She is a member of the Central Texas Nurse Practitioners organization, as well as the American College of Cardiology.